The last month or so has been filled with an unusual number of opportunities for Mike and me to take a little time off from our jam-packed lives at home and have some much-needed time to relax, rejuvenate and re-find ourselves as a couple. We’ve been fortunate that, just as she did last June when we enjoyed my surprise holiday win to Italy, my Mum was willing to take charge of G and M for the duration and we’ve been celebrating our 40th birthdays in style. Our first treat involved a road trip to Birmingham, an overnight stay near the Barclaycard Arena (previously the National Indoor Arena) and an evening spent laughing, courtesy of the tickets I had bought for Mike as part of his 40th birthday present. Just over a year ago we discovered the American hit comedy show, Impractical Jokers and have spent many hours curled up in front of the TV, often with the children added to the mix too, giggling and guffawing at the escapades we’ve watched unfold in front of our eyes. For those of you who have never heard of the Impractical Jokers, this hidden camera show follows 4 childhood friends from Staten Island, Sal, Joe, Murr and Q, as they play a series of practical jokes on each other and the unsuspecting general public. In a hyped-up version of “Truth or Dare”, they challenge each other to complete a string of ridiculous tasks, knowing that failure to complete or achieve the goal will result in the biggest loser of that episode having to undergo a punishment at the hands of their friends. The Jokers usually do not know the details of the pranks until the moment they have to do them and are often pushed to say and do things that are well beyond most people’s normal comfort zones. From saying outrageous comments when serving customers at one of the many stores, fast food joints or cafes featured from New York, to having to convince strangers that they have met before in the most unbelievable set of circumstances, the pranks nearly always have us all laughing out loud. I’d be hard-pushed to say which part of each show we most enjoy, but the final punishments are almost always as funny as the pranks themselves and go from the sublime to the ridiculous. In many ways, it’s seeing the response that adds to the humour of the situation. My Mum freely admits that she can’t see what makes us laugh so much and perhaps it’s true you require a certain quirky sense of humour to enjoy the half-hour episodes. Having missed out on tickets for their first UK tour in February 2016, I was determined to get some for January 2017 and was delighted when I managed to secure 2 great seats at the Birmingham Barclaycard Arena. It took some strategic planning with my Mum – well, I had to check she’d be in the country to look after G and M for the night! – but we got there in the end and I even managed to keep it a secret until the big reveal on Mike’s birthday in October. M was not so impressed with our planned night out, but Mike was as thrilled as I was and the time just flew past until we found ourselves taking an afternoon off from work and bombing down the motorway towards our final destination. We found a great place to stay – City Nites Serviced Apartments – within walking distance of the Arena that included a secure location to park the car and enjoyed a delicious dinner at Thai Edge before the show itself started. We were hoping for a great night out and weren’t disappointed. The Jokers, also known as The Tenderloins comedy troupe, have been performing stand-up for years and their show was filled with a skillful mix of scripted jokes, some improv and the inevitable reveal of previously unseen clips from their successful TV show. I’ll be honest, a few long days and nights on UK tour had obviously taken their toll on all their voices and a heavy drinking session meant that one member of the group in particular was not as sharp as he usually is on-screen, but my favourites, Sal and Joe, were in fantastic form and made the night for me. Mike loved being at yet another live comedy show, having already enjoyed seeing Josh Widdicombe and Dave Gorman for previous birthday treats. It was a brilliant overnight break from the children and one that we both needed after the medical stresses that had stalked us at the end of last year. This entry was posted in Chronic Illness, Family, Parenting, Reviews, Special Needs Parenting, Travels and tagged #40thcelebrations, 40th birthday, Barclaycard Arena, big birthday, Birmingham, Birthday, celebrations, City Nites Serviced Apartments, comedians, comedy, Comedy Central, Conditions and Diseases, Dave Gorman, eating out, family, holidays, ill health, Impractical Jokers, Josh Widdicombe, love, me time, National Indoor Arena, parenting, self-catering, serviced apartments, stress free travelling, support, Thai Edge, The Tenderloins, time off, weekend, weekends away on February 21, 2017 by bluesingingdragon. Today’s a special day. It hasn’t quite turned out as planned, but then again, things quite often don’t in our household. Presents have been bought and wrapped and cards have been written, but the birthday boy wasn’t at home this morning to open them. I thought we might enjoy a family meal together at home tonight, but Mike has been away on business, so we’ll be lucky if we just about manage a strategically ordered takeaway before 9pm instead. I was even hoping to bake a cake, but work commitments have left me running around a little like a headless chicken this week and unless things improve drastically before that 9pm takeaway deadline, I really don’t think that will happen. 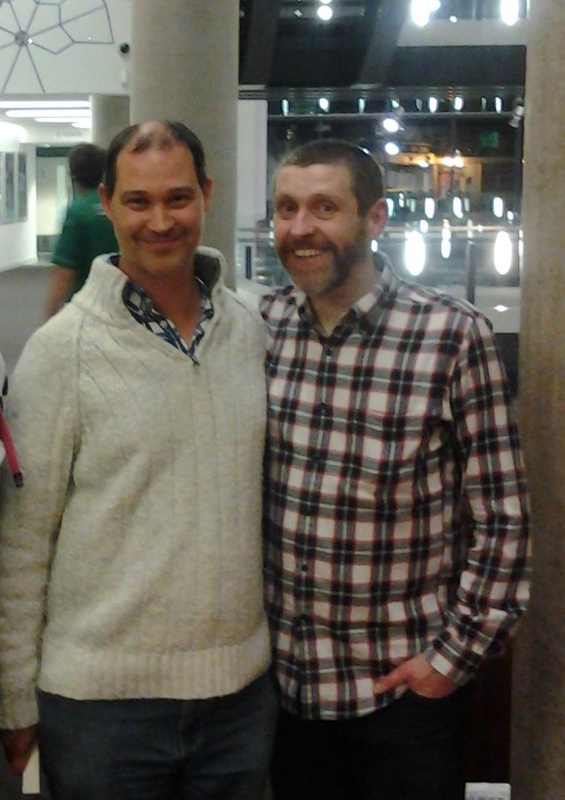 Mike & funny man, Dave Gorman – last year’s birthday pressie. Wonder what this year will bring? So instead, let me take the “easy” way out and instead wish Mike an amazingly happy birthday! It might not have been the birthday celebrations we’d have chosen, but I hope your day is a good one and G, M and I can’t wait to see you tonight for a mini celebration before bedtime. We love you lots. This entry was posted in Family and tagged Birthday, Cake, celebration, celebrations, Dad, Daddy, Dave Gorman, family, Happy Birthday, home, love, presents, Special Diets, work on October 15, 2015 by bluesingingdragon.